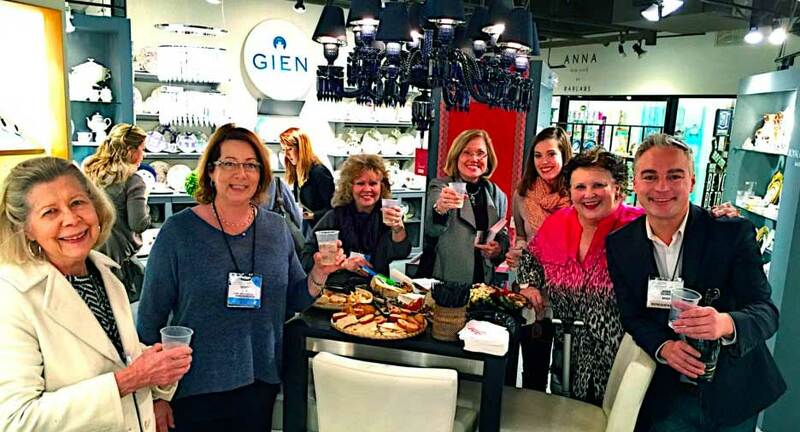 Bridge retailers and brands at the Rosse showroom in Atlanta. Jason Solarek, Bridge CEO and Founder, shown on far right. In 2007, New York-based web designer Jason Solarek was thinking about his clients' businesses over a beer at Moran's pub. He knew that Karen, who owned a retail shop in New York, was adding the same items to her website as John, who owned a store in Ohio. Upon further consideration, he realized that a handful of his clients were adding the same items to their websites, week after week, thereby duplicating each others' work. Drawing the process on a bar napkin, he sensed an opportunity to help his clients save time and money. Solarek decided to ask the retailers to team up with a few popular brands and share the product data. Solarek would ask the brands to input and maintain the data in Bridge - saving the retailers the hassle. Using Solarek's platform, the data would then 'flow downstream' to the retailers' websites. 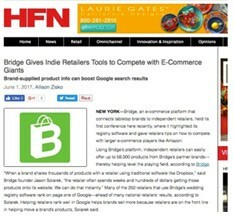 Today, Bridge helps 1,000's of businesses in the home goods industry share products, news, and market-sensitive data. 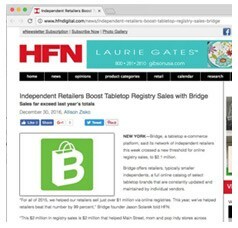 Retailers use Bridge's online platform to more easily sell 60,000 products from 110 home goods brands. In 2019, retailers will use Bridge's e-commerce platform to sell $11 million to their customers. With Bridge, retailers, brands, and sales reps streamline communication and speed product to market. Why Do We Help Indie Businesses? Shopping local is proven to help support our schools, families, and communities. Specifically, shopping local helps produce local jobs and generate local tax revenue. Due to this, Bridge supports shopping local and enjoys developing community empowering software. Jason Solarek, Bridge's CEO, grew up in Rochster, NY—a city that has seen its ups and downs and can benefit from local businesses growing. Using Rochester as inspiration, we seek to help towns and cities of all sizes grow and 'own' their futures vs let a distant tech behemoth undermine their community. Jason Solarek, sitting at the bar Moran's in New York City, draws the idea for Bridge's product sharing. Bridge is a finalist in British Airways' small business contest. Bridge starts holding annual seminars in Atlanta. Shown speaking: Matt Hullfish. Bridge starts holding training webinars for members. Bridge launches the bridal incentive program to motivate brides to promote their registry and earn a gift card. Bridge creates free table tents and window decals for retail clients. These in-store materials increase awareness about the stores' gift registries. Bridge launches new automated review software. Retailers start receiving record numbers of customer reviews. Bridge creates the world's first 'dollartag.' Retailers can now tag products as easily as they do friends. Showrooms in Atlanta and Dallas start displaying Bridge table tents. These help brands connect with more retailers via the network. Bridge holds its first conference for brands in NYC. Bridge starts hosting 'Your Store vs Amazon' seminars. Bridge creates the Smart Universal Login System. This enables businesses to login once and visit many different wholesale sites without logging in again. 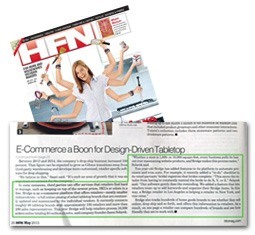 This solution makes it faster and easier for stores to view and buy a brand's products. Users don't have to create and remember new passwords on each site. Read more about the Universal Login System.